Haley Real Estate Group is located in Omaha, Nebraska and specializes in the underwriting and acquisition of multifamily assets. Our focus is on acquiring well-located multifamily assets in secondary and tertiary markets in the Central United States. We currently own properties in 17 states with a footprint extending North to Michigan, South to Florida, East to Virginia and West to Nevada. A map of our current assets can be found at the DEI Communities website. 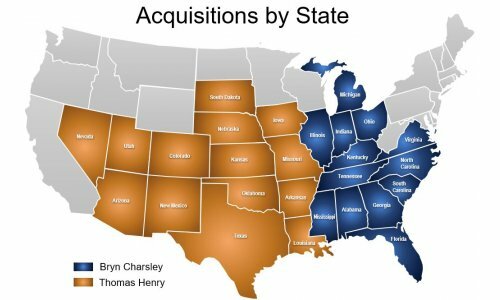 The map below highlights the states in which we are concentrating our acquisition efforts. We center our attention on finding properties with 200 units or more. Exceptions can be made in markets where we currently have an ownership presence. We focus on purchasing two and three story garden style apartments although we will also consider mid-rise and high-rise construction. We prefer 1980 construction and newer but we will review older product as well. Our main objective is to acquire properties with the aforementioned qualities and strong cash flow or properties that exhibit an economically viable value-add opportunity. We are comfortable with assets in University markets (excluding by-the-bed deals), mixed use developments and REO assets. We also focus on properties in need of a significant rehab. Our goal is to place one “Deep Rehab” asset in each of our investment funds. We can complete purchases of all structure types including all cash and assumptions.